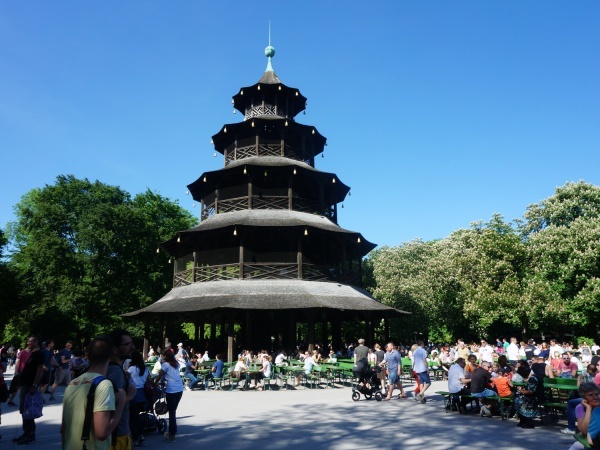 The beer garden Chinesischer Turm is located in the English Garden (Englischer Garten), Munich's largest park area. With a size of 417 hectares, the English Garden is larger than Hyde Park in London or Central Park in New York. Due to its close distance to the university, the beer garden often attracts a young crowd, mixed with park visitor including many tourists. In 1789, on Great Elector Karl Theodor's initiative, the creation of the English Garden began with his plan to convert a former hunting area located at the Isar into a recreational nature. In 1790 the Chinese Tower (Chinesischer Turm) was built. The Chinese Tower is a pagoda-style, all-wooden tower with five storeys. The 25-metre tall tower has a diameter of 19 metres at ground level and six metres at its top level. The Chinese Tower was destroyed during World War II in 1944. In 1952 the tower was rebuilt to its original and current style. The Chinesischer Turm beer garden is the second largest beer garden in Munich and has about 7,000 seats in the self-serviced area and about 500 seats in the serviced area. Guests in the self-serviced area can sit on regular beer garden benches, some of which have back rests. The benches are arranged around the tower. The food stalls offer traditional beer garden food such as Steckerlfisch (grilled fish on a stick), Hendl (roasted chicken), Schweinshaxn (roasted pork knuckle), Obatzda and Auszogne. The beer served is Hofbräu and a Maß Hell (lager) costs €7.90 (May 2016). Before or after a cool Maß guests can enjoy a ride by horse carriage through the park, starting directly at the entrance of the beer garden. Since 1945 Kutscherei Hans Holzmann offers tours in traditional carriages. On weekends brass-bands perform live on the first floor of the tower. A highlight of Chinesischer Turm is the yearly Kocherlball which is held in memory of the cooks and servants of the noble families of the 19th century. In the late 19th century, up to 5,000 Munich servants met during the summer months every Saturday morning for a dance at the Chinese Tower. Usually they met before work between 4am and 5am. 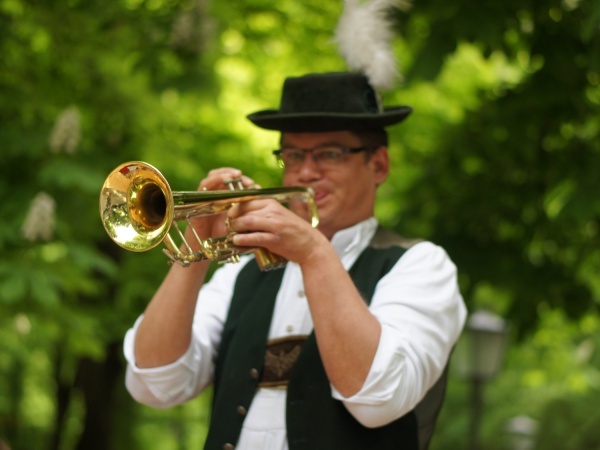 Today the Kocherlball takes place on the 3rd Sunday in July between 5.30am to 10am (if the weather is bad a week later). 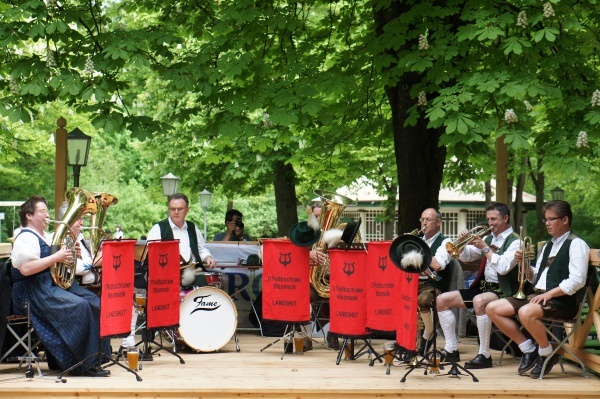 The ball attracts thousands of participants, many of which wear historical outfits and Bavarian costumes. Depending on the weather, the beer garden is open from 10am to 11pm. In Winter, End of November till December, 23rd, a christmas market is held here. This page was last modified on 18 May 2018, at 18:43.